The Q200/HE digital recorder can be used as either a Holter monitor or looping Event recorder. The Q200 HE Event Monitor is useful in diagnosing patient symptoms such as chest pain, syncope, palpitations, shortness of breath. The Q200/HE event monitoring data is analyzed by the QRS LX Analysis software. LX Analysis allows for full review of all the ECG data recorded during the event monitoring study. 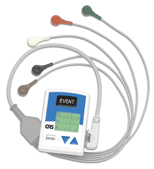 Multi-Function Holter recorder or 30-day Event monitor.